Among the many interesting photos in the Dibner Library's collection of portraits of scientists is this 1934 photo of Marie Curie (1867-1934). Curie was the only woman to win two Nobel prizes – the 1903 award in Physics, along with her husband Pierre, for research on radiation phenomena, and the 1911 award in Chemistry for her studies in radium and polonium. 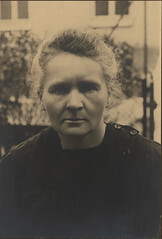 Marie was also mother to Irène Joliot-Curie, the recipient of the 1935 Nobel Prize in Chemistry. Marie Curie died in 1934 from aplastic anaemia, a blood condition often associated with exposure to large amounts of radiation. Hello! My classmates and I are 7th graders at Roberto Clemente Middle School, which is located in Maryland. We are doing a project for National History Day, which is a contest that focuses on important historical events or people. For this, we chose to create a documentary about the scientist, Marie Curie. We were wondering if we could set up an interview with a professional specialized in the field. We would just like some basic information on triumph and tragedies in her life. We are under a strict deadline so meeting as soon as possible (preferably before the 15th) would be great. Please contact me if you are available for an interview. Thank you so much!